NIRJAFT is engaged in research on post harvest technology of jute and allied fibres (mesta, sisal, sunhemp, pineapple, ramie, coir, banana, etc.). Development/ modification of new technologies and problems solving of industries is being done efficiently. Two Capsularis varieties and one Mesta variety have been identified. Development of image processing system to evaluate defects of raw Jute. Seven bacteria and seven fungi were isolated from retting water samples and their morphological properties were studied. Development and fabrication of a tester for measuring thermal insulation property of textile and non-textile materials. Frontline demonstrations conducted under Jute Technology Mission elicited the novelty of accelerated retting process over the conventional process for fibre extraction. Based on quality character evaluated by the institute and yield performance, two Capsularis, one Olitorious and one Mesta varieties were identified for release in the annual workshop of All India Network Research Project on Jute and Allied Fibres. Six fungi isolated from different retting water samples were determined for their enzymatic activity. By mutation technique through UV radiation, one strain DB2-M4 has been developed which perform better than parent strain, DB2. For grading of Ramie fibre, two-level grading system are proposed i.e., hand and eye method at producers’ level and instrumental method at users’ level. Extraction of good quality fibres from decorticated Ramie, Pineapple leaf and Banana sheath by the use of a bacterial consortium could be possible. Developed computerised software system to provide support for users specific analysis on jute linear density was further upgraded for statistical analysis in quick, easy and efficient manner. Development of a prototype bending rigidity tester for rigid/curly fabric as well as testing method in the same instrument. Retting residues from water saving retting method was found to be good soil nutrient. The lignin fraction extracted from jute plant were characterised and modified for making use in adhesive formulation. The fungal dry retting of fibre with fungus Sclerotium delphinii showed improvement in fibre quality. A need based process control system has been designed and developed using Programmable Logic Controllers (PLC) to run jute processing machines very efficiently. A model system has been installed in pilot plant of the institute for the apron draft spinning system. Extraction and spinning of Dhaincha fibre in blend with jute for making plied yarns. Development of fancy / decorative fabric with jacquard design in cotton handloom using fancy jute covered yarn and knitted products for ladies and gents sweaters. Successful application of tubular fabric made from jute and HDPE tape for protection of Mayurakshi river bank in Birbhum District, West Bengal. Development of handloom with jacquard facility for weaving jute based fancy / decorative fabric. Three types of jute-polyester and cotton blended fabric suitable for making warm outer garments have been developed. The study on evaporative cooling effect by jute based wetted pads showed that highest cooling effect and maximum increase in relative humidity were effected by woven jute pad in forced ventilation. A prototype handloom has been developed for production of jute based fancy fabric for use as upholstery and decorative fabric. Six types of winter fabric from jute-hollow polyester blended and cotton yarns have been developed for making jackets. Products like table cover, bedcover, quilt, cushion cover, sofa cover, curtains, apron, etc. were made with the fabric developed from jute-polypropylene blended yarns. Development of braided yarns from jute and allied fibres. Development of knitted / woven fabrics with different fabric particulars and designs for high value modern home furnishings, draperies, apparel and fashion textiles. A complete package of practice for production and utilisation of geotextiles for protection of rainfed river bank from soil erosion has been developed. Processing of flax in jute system resulted in the development of finer yarn of linear density 100 tex for apparels. Composite structured geotextiles using jute, polypropylene and coconut fibre has been developed. Ornamental jute fabrics have been prepared in the developed handloom for value added products and a design bank has been created. Raw unretted coconut fibre can be softened chemically to the extent of 50% or more. Twisting zone of existing jute spinning machine has been modified to make finer yarn. Studies on combustion of briquettes in gassifier showed the desirable consumption. Thermogravimetric behaviour of jute caddis briquettes was studied by instrumental analysis. Development of medium density composite board form blend of whole jute plant and bamboo. Dyeing of jute fabric with indigosol and sulphur dyes improves the consumer appeal of the fabric for making diversified products. Bio-pretreatment with cellulase and xylanase enzyme showed improvement in absorbency, whiteness, brightness and yellowing properties of jute fabric. High permanence paper was obtained from alkaline sulphite pulp of jute by borohydride hydrogen peroxide bleaching method. Composite particle board made from date palm leaf, jute stick, saw dust showed better sound absorption property than that of plywood and board made of 100% jute stick. Study showed that bleached handmade paper is more susceptible to microbial damage than unbleached handmade paper. Writing grade paper was developed by pulping of jute residues in small scale trial. Bio-assisted bleached jute fabric showed better optical, absorbency, handle property than the conventional chemically scoured-bleached jute fabric. Process for making pulp and handmade paper by utilising Date Palm leaves, as potential raw material, has been developed. Development of products viz. writing pad, file cover, carry bag, etc. from the developed handmade paper from Date Palm leaves. Process for generating fibres from whole jute plant using disc refiner have been developed, which is the first step of preparing fibre board. Application procedure for dyeing of jute fabric with natural dye “Manjistha” has been developed. Process for dyeing of bio-processed jute fabric using cold brand reactive dyes have been developed. Paper made by ASAM process gives better yield and strength properties compared to kraft and alkaline sulphite process. Jute-polyester resin composites have been prepared to study the effect of type and degree of reinforcement. The institute is actively engaged in rendering consultancy services to the entrepreneurs and industry for technical knowhow, preparing project report and other technical assistance. The institute conducts various field demonstrations and trainings on retting, grading, yarn/ fabric preparation, processing/ finishing, products of jute and allied fibres for popularization, awareness and transfer of field worthy technologies. New entrepreneurs are trained on NIRJAFT technologies for their skill development. The Institute also having an incubation centre for incubate regarding different technologies developed by the institute. The laboratories of the institute are well equipped with wide range of sophisticated instruments and equipments for physical and chemical analysis. This infrastructure can be extended for the outside organizations for testing their samples on payment basis. The NIRJAFT library is one of the glorious and prestigious library in the ICAR. Documents are available since 1938. Total Nos. books 19,700 (text books, monographs, reference books and standards are available in the relevant subjects). Library subscribes 56 Nos. Indian and 14 Nos. Foreign journals, World textile abstract+ On-Line is available since 2011 (hard copies available from 1969 to 2010) and Journal of industrial textile+ On-Line. We are the member of CeRA. 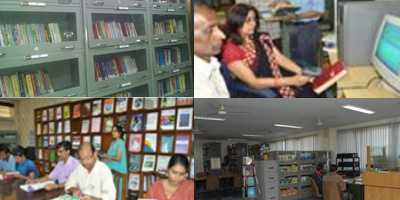 Library renders photocopy services, current awareness services and abstracting services. Different scholars & researchers from different universities, institutes and research organizations very often use our library. A well furnished official guest house is attached with this institute for staying the guests of NIRJAFT, ICAR personnel and others. Hostel can also be provided to the trainees of NIRJAFT. The institute auditorium, meeting room and two conference rooms are well equipped with modern audio and video facilities. This can also be provided in non institutional purposes on payment basis. Scientists of this institute are also involved in academic assignments with different universities and institutes. University students are also entertained to upgrade their knowledge by interaction with scientists, performing project works and using library. NIRJAFT is assigned for quality & processibility evaluation of fibres under All India Network Project of Jute. Quality & processibility certification for new variety release is also given.